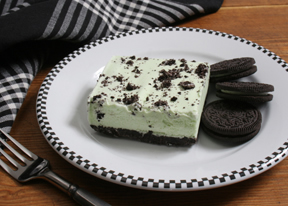 Refreshing mint ice cream in a crispy chocolate-flavored crust. 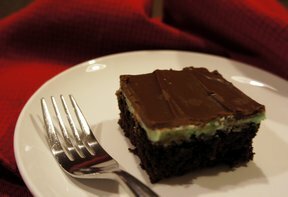 A minty-flavored dessert that makes a perfect light and tasty ending for any meal. Butter the bottom and sides of a pie plate; set aside. Melt the butter and chocolate together in a saucepan large enough to hold the Rice Krispies when added. Heat the butter and chocolate to a boil and then add the sugar. Remove from the heat and add the Rice Krispies; stir until evenly coated. Reserve 1/2 cup of the Rice Krispie mixture for the top and then pour the remaining into the buttered pie plate; pat firmly into the bottom and on the sides. Place the Rice Krispie lined pie plate into the freezer until frozen. Once the crust is frozen, allow the ice cream to thaw slightly so that it is soft enough to spread out. 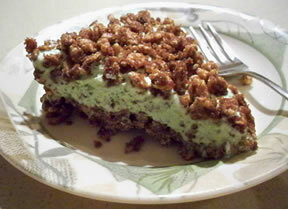 When it has thawed enough, remove the crust from the freezer, add the ice cream, and spread it out evenly into the crust. Sprinkle the reserved Rice Krispie mixture evenly over the top of the pie. Place the pie into the freezer until it is firm. To serve, remove from the freezer a few minutes before serving so it is easier to cut. "Yummy dessert! Sweet but refreshing. The perfect way to finish a meal. 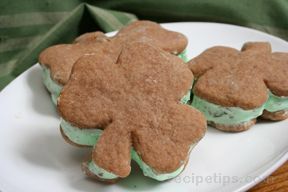 It would also be a good dessert to serve while enjoying a cup of coffee with friends."